Look at this. Just look at this! 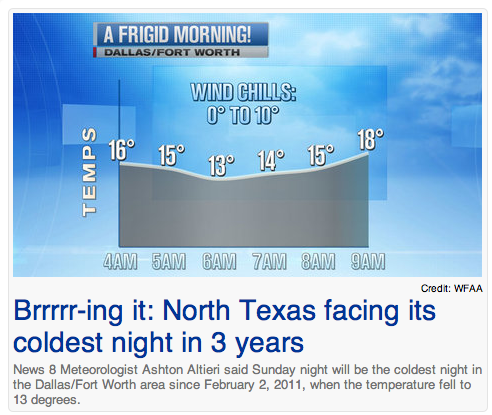 I don’t want to be the coldest I’ve been in three years!!! At least it’s not going to snow or ice or anything, or else we’d have another Ice-Apocolypse situation on our hands. Texans can’t handle this. We just can’t. We are not designed for cold. Want to know something about the human body? Whenever the brain thinks the body might be in danger of freezing, it sends out a message to the body to stop the flow of blood to our non-vital extremities (fingers, hands, toes, feet, nose, ears, etc…) in order to warm and preserve our important body parts, like the lungs and the liver. That’s why, when we get cold, our fingers and toes get numb. Well, when Texans (or at least when I) go outside and it’s even a little itty bitty bit cold, our extremities go numb almost immediately. Our brains equate the cold with death. Okay yeah, that’s a little extreme, but seriously. My brain gets very melodramatic when it detects temperatures below 80 degrees Fahrenheit. It has absolutely no faith in my body’s ability to survive in cold. I will have even less inclination than usual to drag myself out of bed tomorrow morning. Monday. Ugh. Gross. 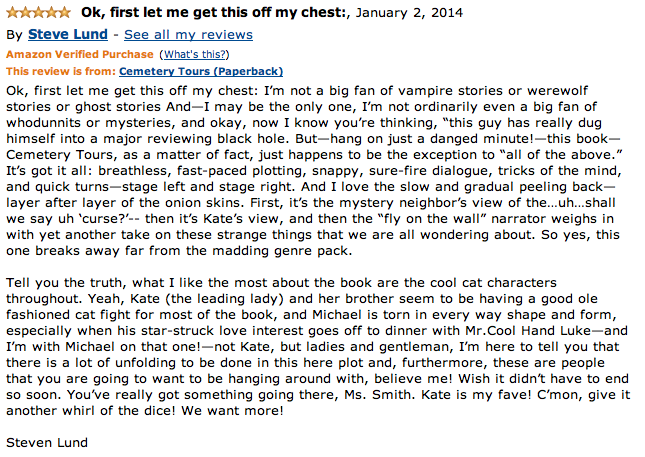 The good news is… Cemetery Tours got another great review. Sadly, reviews will not keep me warm at night, but they do make me happy, which means, my fellow Texans, that it is possible to be cold and happy at the same time. This is what happens when winter comes to Texas. It’s not snowing, it’s not sleeting, I don’t think it’s even below freezing, and already, the government is activating the emergency plans. THAT is how terrible people are at driving in the snow down here. Sort of sad. Sort of amusing. All true.